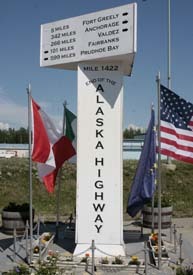 The Alaska Highway was constructed during World War II as a military route to carry supplies to military installations in Interior Alaska and to the airfields enroute. Airfields at Northway, Tanacross, Fort Greely and Ladd Air Base (now Fort Wainwright) were actively engaged in the transfer of aircraft between the United States and Russian allies. The pioneer road, through swampy tundra and rocky mountains, was begun in March of 1942 by the men of seven Army regiments working with 47 contractors and the Public Roads Administration. Crews worked south from Delta Junction and north from Dawson Creek. What we now know as the “Alaska Highway” was completed when the two crews met on the southern shore of Kluane Lake in November, eight months later. According to reports, the Alaska Highway was intentionally built with many crooks and turns so that convoys of supply trucks and equipment could not be entirely wiped out by enemy bombers strafing in a straight line. Stories of the building also relate that, in some places, the swamp was so bad that crawler tractors would sink so deep they could not be retrieved and the road was eventually built right over the top of some. At the peak of construction, in addition to the military men, 77 contractors working on the Alaska highway employed over 15,000 men and utilized more than 11,000 pieces of equipment. Total construction cost for the 1422 miles was $115 million. 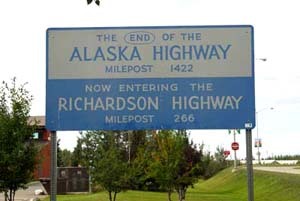 Through the efforts of both the United States and Canadian Governments, the Alaska Highway, which was known as the ‘Alcan’ for only a short time after construction, has been continually improved, widened and straightened – and shortened somewhat. 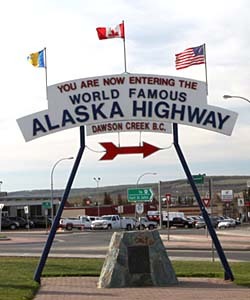 Today, the Alaska Highway is a modern road and paved almost all the way from Dawson Creek to Delta Junction. A few short stretches of gravel remain, but even these surfaces are beautifully maintained by Yukon and Alaska road crews.